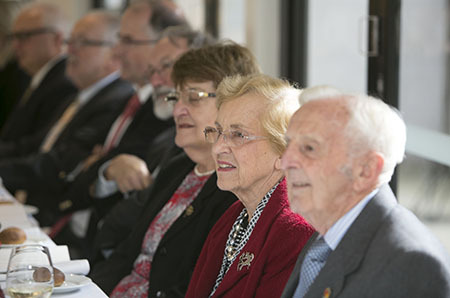 The beginning of May saw Monash President and Vice-Chancellor, Professor Margaret Gardner AO, host the annual Matheson Society luncheon. The Society celebrates and recognises those who have made the generous decision to leave a gift in their will to Monash. Attendees were delighted to hear from key note speaker and Monash Emeritus Professor, Graeme Davison AO, who regaled them with tales of the ‘parents of Monash’, the first Vice-Chancellor, Sir Louis Matheson and his wife, Lady Matheson. He described how the Mathesons laid the foundations for an inclusive and progressive University, liberal in spirit and fresh in outlook. Emeritus Professor Davison is renowned for his classic book, The Rise and Fall of Marvellous Melbourne, as well as co-authoring University Unlimited: The Monash Story. He has held a number advisory appointments at the State Library of Victoria and the National Museum of Australia among others. In 1988 Emeritus Professor Davison founded Australia's first graduate program in Public History and became an Officer in the Order of Australia in 2011. Authorised by: Chief Marketing Officer, Strategic Marketing and Communications. Maintained by: Giving to Monash Webmaster Team. Last updated: Jul 2018.